A huge thank you goes out to Jane Archer, Erin Shigaki, Roberta Fabiano (first timer!) and to Ray Alma, who led the group at St. Mary’s groundbreaking celebration. 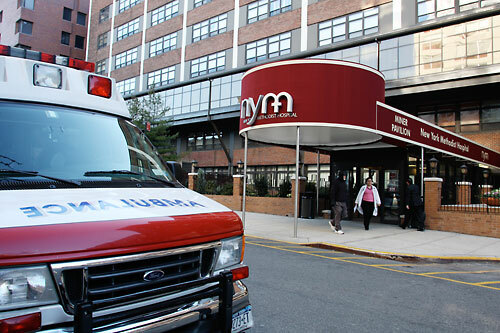 We were very happy to show our support for this special place and their long-awaited modernized facilities. These kids definitely deserve their great new digs! Rami Efal and Oded Naaman crafted some great Autumn collages and drawings with Naisha, who loved her Fall landscapes and Dimitry, who wowed everyone with his superlative Disney and Scooby Doo sketches! Ray Alma, Jane Archer, Oded Naaman, Nathan Schreiber, Karrie Witkin and the Bellevue kids created their very own animated flip books tonight! Thanks, volunteers and to the great kids and staff who always welcome us with their endless warmth and creativity. Thank you Rami Efal, Henry Hilaire, Franz Palomares and Erin Shigaki (first timer!) for joining the kids at New York Methodist today! Everyone drew the kids’ favorite characters playing sports and being sporty in general. Rami and Erin drew bedside with two little guys, one of whom was especially glad to receive his creative gifts as it was his birthday. Happy birthday, Christian! What a pretty picture the RMDH kids and Ink Well volunteers made as they drew miniature scenes inside picture frames together (as well as a Hulk drawing or two)! Thank you very much to Ray Alma, Jane Archer, Leyah Jensen, Yunmee Kyong, Marty Macaluso, Eun-Ha Paek, Tim Savage, Ed Steckley and Karrie Witkin who all made this night a great one. 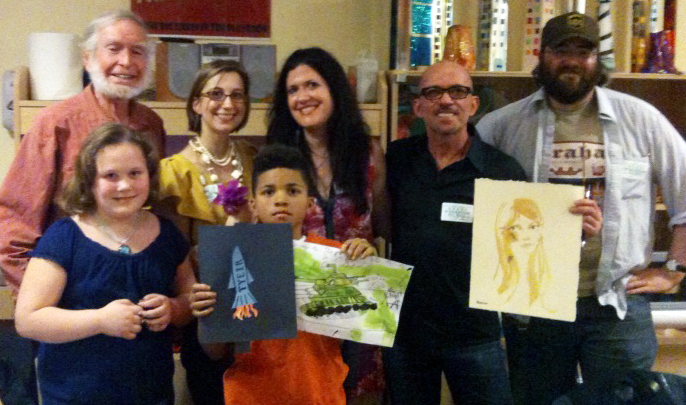 It couldn’t have been a finer night with the wonderful kids of Bellevue and the Ink Well gang. We got our 4th of July game on, drawing Abraham Lincoln hanging out with Obama, the Statue of Liberty showered in fireworks, and of course many many superheroes. An enormous thanks to Ray Alma, Jeremy Arambulo, Jane Archer, Howard Beckerman, Bil Donovan, Franz Palomares, Jason Patterson (first timer! ), Nathan Schreiber, Ed Steckley, and Elizabeth Winter who all joined the fun and kept it going at Totonno’s Pizza later that night. 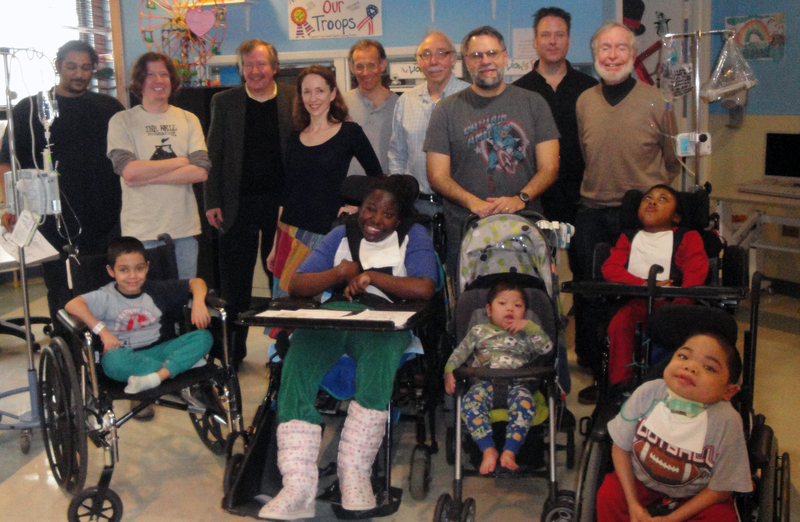 Thank you Rami Efal and Ed Steckley for sharing smiles with the Sparks of Life kids! 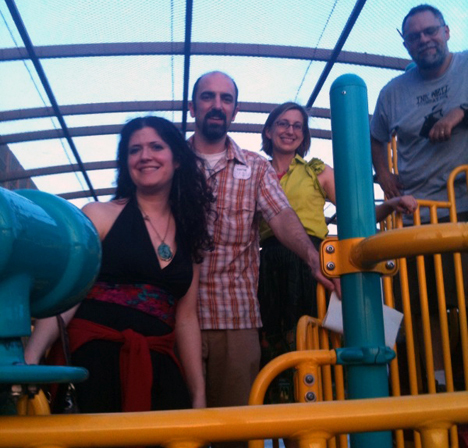 Jane Archer, Franz Palomares, Karrie Witkin, and Ray Alma had a rooftop party with 17 kids today! They drew fantasy summer rides like convertible Corvettes and helicopters carrying princesses, all under the beautiful setting summer sun. Thanks, everyone!! The Earth Day festivities continued this week as the Sparks of Life kids invented “Guardians of the Earth” characters with Rami Efal and new member, Jeremy Arambulo. Way to go guys! We celebrated Earth Day with the wonderful kids of Bellevue today by decorating blank puzzles with the kids’ favorite places on the planet, which were forests, flower gardens, Six Flags, and movie theaters! Thank you very much to Ray Alma, Sergey Aniskov, Jane Archer, Nola Denett, Joyce Pedretti and Karrie Witkin who all made this Earth Day a very special one at Bellevue. Hooray for Jane Archer, Howard Beckerman, Pedro Delgado, Bil Donovan (first timer! ), and Karrie Witkin who all bounced up to the Ronald McDonald House to draw Springtime critters for the kids! Baby bunnies, ducks and geese bounded through portraits, fashion sketches and more. Thank you all for making it a great night! Sergey Aniskov, Jane Archer, Valerie Reupert, Michael Wetterhahn and the Gilda’s Club kids flipped out over their home-made flip books; animating witches, puppies, and characters from Invader Zim! 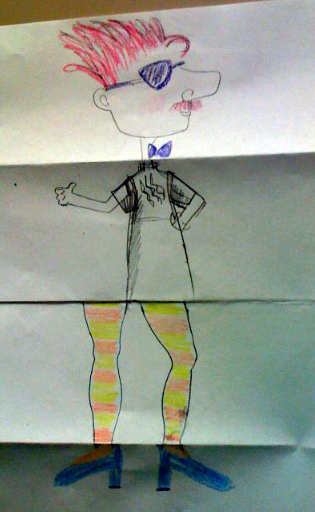 Looks like we’ve got some future animators in the works. 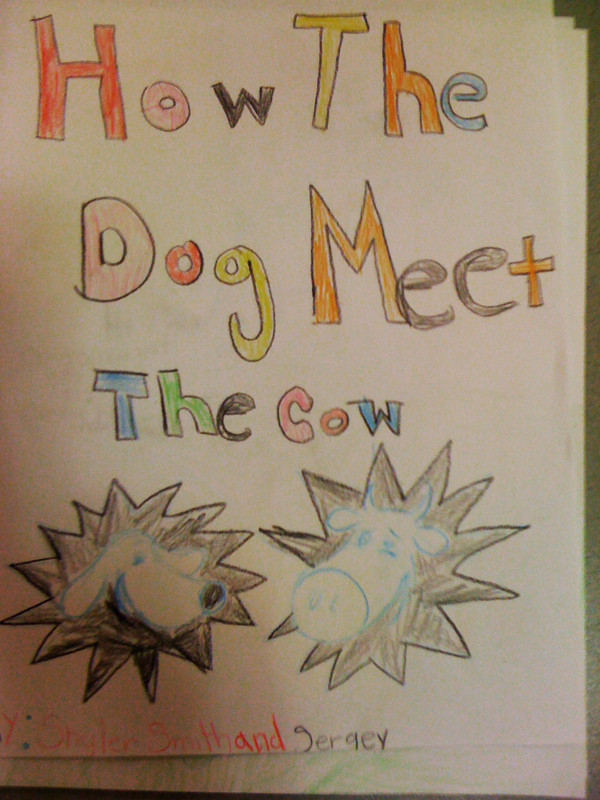 Sergey Aniskov was treated to an adventure tale that young Skyler made up all by herself and together they made this beautiful book, “How the Dog Meet the Cow.” Meanwhile, Rami Efal drew “Spring beach day on the moon” with Nicolas: space flowers and a rocketship shuttle back and forth between Earth, the moon and the sun. What fun! The snow couldn’t keep us away from the great kids of St. Mary’s! Left to right: Sergey Aniskov (first timer! ), Adrian Sinnot, Elizabeth Winter, Joe Vissichelli, Tim Savage, Ray Alma, Ed Steckley (first timer!) and Howard Beckerman all had a a ball, creating scenes with character models from our artists’ work. Batman flew with butterflies, Spike from The Rugrats chased a birdy, and all the kids’ caricatures laughed along. Thank you so much to our volunteers and to the wonderful kids and staff at St. Mary’s. Welcome to Franz Palomares who came to his first Ink Well today! He and IWF Director, Rami Efal, spent a wonderful afternoon drawing with Denzel, who wanted to make a Valentine’s Day card for his mom. Denzel has been hospitalized for two weeks and was happy to have a fun way to shake up his day. Thank you, Franz and Rami, and thank you, Denzel, for sharing your day with us! Thank you to Jane Archer, Jeanine Henderson, and Karrie Witkin who all celebrated Australia Day with mixed up, upside down, folded drawings in honor of the Land Down Under. They folded pieces of paper and took turns with the kids, drawing characters bit by bit, revealing fantastic collaborations in the end! 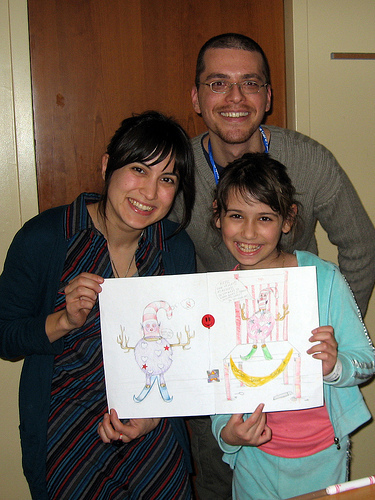 Thank you Tricia Kleinot and Rami Efal for creating holiday drawings with two wonderful kids today! Rami drew bedside with a 7-year old boy who wanted to make a special picture for his 4-year old brother and Tricia got to create fun Christmas cards with a 10-year old girl, her mom, and her grandparents! Thank you everyone for a festive end to a great year. 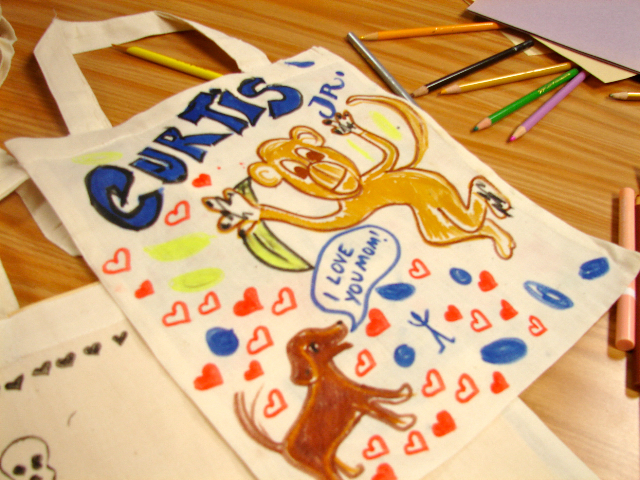 Thank you so much to Jane Archer, Pedro Delgado, Nola Denett, Jeanine Henderson and the kids of Bellevue who all made fantastically festive tote bags that the kids got to keep! Happy holidays, everyone! Rami Efal shared a lovely afternoon with Sasha, drawing portraits and scenes filled with sunshine. Thank you, dear volunteers, for creating the personalized pillow cases of the Bellevue kids’ dreams. Ray Alma, Jane Archer, Nola Denett, Joyce Pedretti and Karrie Witkin all had a ball and we were very happy to have new member, Jeanine Henderson, with us too! The kids honored Thanksgiving by drawing what they are grateful for and what they can’t wait to put in their bellies. Our artists and the Gilda’s Club kids had so much fun together this halloween, it was scary! A monstrously big thank you goes out to Jane Archer, Justin Bilicki, Tricia Kleinot, Joyce Pedretti, Sarah Takenaga and Nathan Schreiber who all made this annual halloween bash so great. An enormous thank you to the wonderful Berndt Toast Gang and other Ink Wellers who brought so many smiles to the children of St. Mary’s Hospital last Friday. Ray Alma, Howard Beckerman, Dan Danglo, Joyce Pedretti, Tim Savage, Adrian Sinnott, and Joe Vissichelli all came to support the National Cartoonists Society in their endeavor to promote volunteerism on this day. Rami Efal and Nathan Schreiber teamed up again to create frightfully fantastic Halloween pictures with little Romeo. Thank you, Sparks of Life kids, for inviting The Ink Well back every month for this great midday event! Our tremendously tough volunteers flexed their artistic muscle at the Coliseum Gym’s New York Strong Man Competition to benefit The Ink Well! We are grateful to the organizers of this event, Teddy Theodoropoulos and Joe D’Agostino, and to our own artists who lifted face painting and caricature drawing to new heights. Way to go Ray Alma, Jane Archer, Nola Denett, Leyah Jensen, and Joyce Pedretti! Thank you to Rami Efal and a big welcome and thank you to new member, Nathan Schreiber! 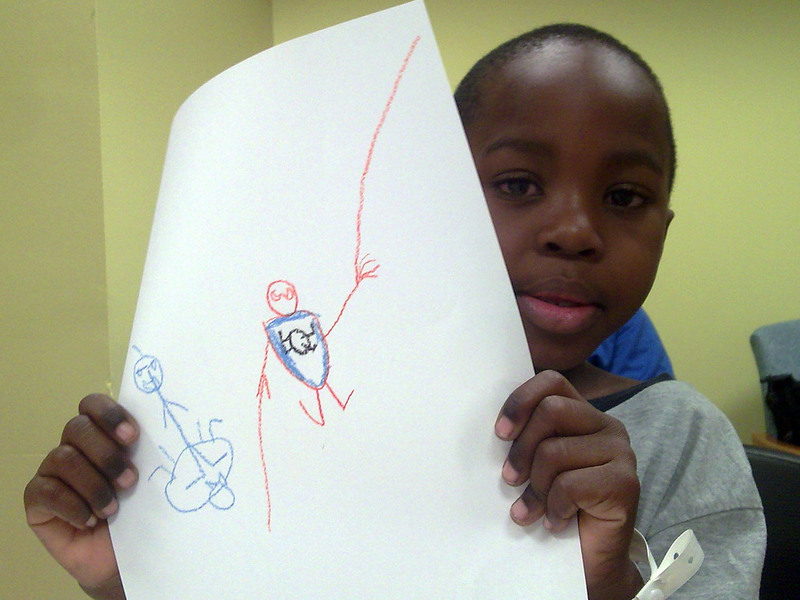 Both artists spent a lovely afternoon drawing with The Sparks of Life kids. 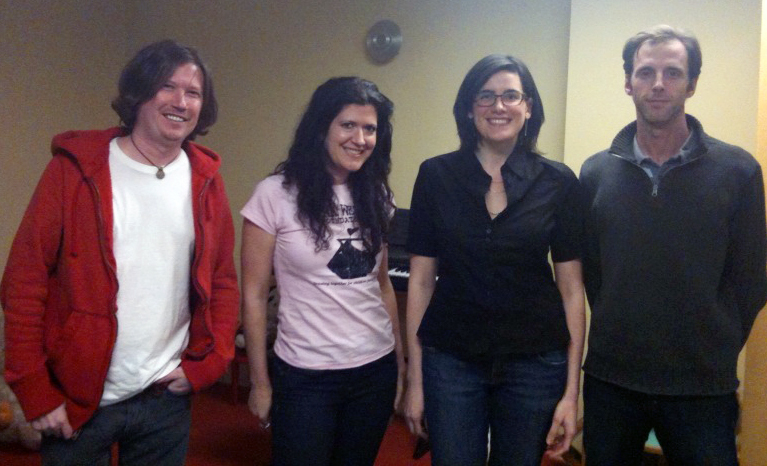 Jane Archer, Justin Bilicki, Henry Hilaire and new member, Oded Naaman, played picture-in-picture with backgrounds from some of their own shows and other old favorites. The kids got to jump into a Simpsons pool party, sploosh around with Sponge Bob, tear down the street in Speed Racer’s Mach 6 and make up funny characters for Superman to meet. Thank you all for a really fun night! Lots of lovely people made our summer party the place to be this August 17! We can’t wait to draw with the new artists we met and we loved hanging out with the old crew too. Thank you to Rami Efal, Jane Archer, Elizabeth Winter, Pedro Delgado, and Ray Alma, who drew cool, refreshing scenes to combat the sweltering August heat with the great kids of Bellevue! Icy hearts fell from the clouds, polar bears enjoyed their popsicles and everyone had a lot of fun chillin’ out together. Thanks also to IWF Director, Jane Archer, who brought lots of glitter and sequence (hence the brooms). 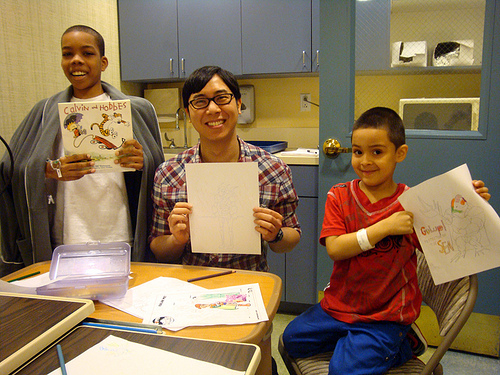 Rami Efal had a lovely time drawing with Alyssa and Gia at New York Methodist Hospital. Rami and Alyssa even got into a drawing duel that culminated in a collaborative creation showdown! Thank you, Rami and Sparks of Life kids! Thank you, Rami Efal, for a great day of drawing with the Sparks of Life kids. We’re always looking for more volunteers for this monthly midday event so spread the word! Thank you IWF Director, Jane Archer, for putting together a super soiree at Bellevue! She and mask-making maven, Nola Denett, and new volunteer, Debbie Peiser helped the kids create their very own masquerade couture. Thank you Nola Denett, Rami Efal and Nina Frenkel for creating Dream Summer Vacation drawings with the children of New York Methodist Hospital! The kids also designed sparkle jewelry (and inadvertently sparkle confetti all over the floor- thank you, volunteers, for much sweeping afterward!). Pedro Delgado spun his famous, masterful web of superheroes and Nola Denett outdid herself again by making custom-fit, capes, headbands and hats for the kids on the spot. Thank you to all our wonderful volunteers and to the courageous kids of Bellevue! We roared in with a Spring party at Gilda’s Club! Thank you to Jane Archer, Nola Denett, Pedro Delgado and new member, Joseph Gallagher, who drew animals reemerging from hibernation, caricatures of kids playing outside and even some witch doll costumes for a Wizard of Oz homage (ya know, tornado season). Thanks, everybody! We had a fabulous night of fashionable puppet making tonight! Actress in the making, Quenell, got her very own catwalk of puppets, modeling her future Oscar gown. When asked which dress she liked the best, Quenell said, “I’ll take them all!” Thank you to Amber Alvarez, Jane Archer, Nola Denett, Elizabeth Winter and Karrie Witkin who created sparkly, taffeta lined dresses and purse puppies who carried their own purse puppies. Thank you Nola Denett, Rami Efal and Nina Frenkel who crafted fantastic hats, drew mixed up sandwiches and more at NYMH this week. Thank you also to Adam Pierce of Charged in Brooklyn, who donated stuffed animals to the Sparks of Life kids! Thank you, fine volunteers, and thank you to the great kids of Bellevue! New member, Nola Denett, had this event in the bag with her wonderful handmade pouches! She joined, Ink Well Board Member, Rami Efal, and The Sparks of Life kids as they all drew funny bunny fish and even a tailor-made Wall-e portrait. 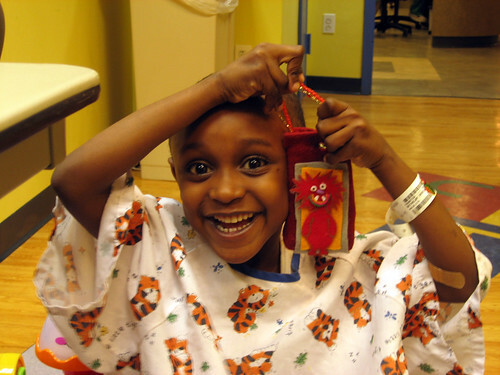 Thank you, Nola and Rami and thank you to the children at New York Methodist Hospital! Thank you Rami Efal and Nina Frenkel for helping the great kids of New York Methodist Hospital come up with holiday cards for their parents! One child outdid us all by making his cards using only one arm since the other was occupied with an IV! 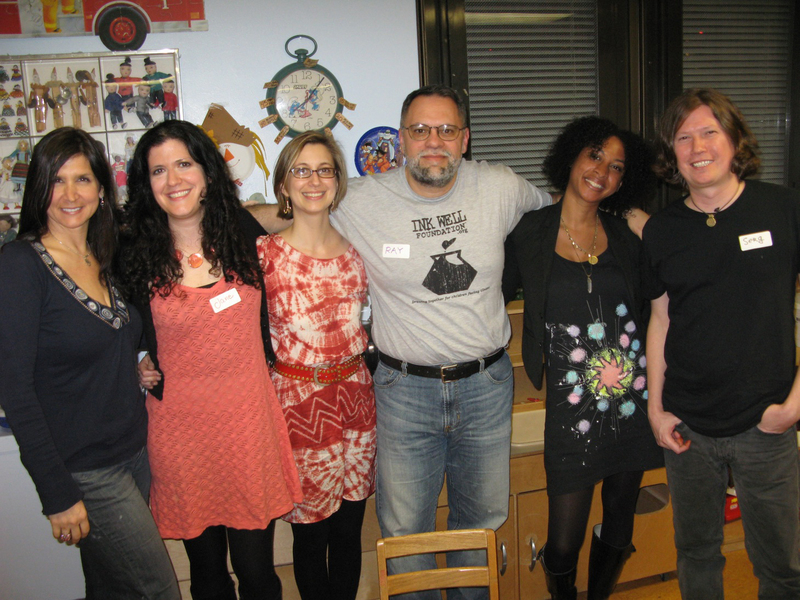 Thank you, volunteers for braving the wintry weather for this, our last event in ’08. Happy holidays, everyone and see you in the new year!